I've lost my voice today except for a little creaky croaking. Caroline is doing much better but still coughing. Mike is still really sick. He's taking a nap now. Despite our sickness, I feel peace and joy today. 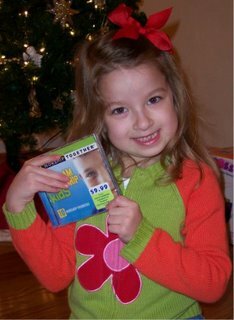 Caroline is listening to a kids praise and worship tape my sister got her for Christmas. Just hearing her little voice sing worship songs makes my heart feel glad. It makes me feel like I have done a good job as a Mother. My number one goal for 2006 is to be closer to Jesus, to tell more people about Him and to live as He wants me to live. May your new year be filled with peace, joy and love. Happy New Year!!! I'm so glad my baby likes her CD and feels like singing along. Give her a hug for me as I'm too sick to see her.